The Houston Endowment acquired 1.6 acres near Buffalo Bayou west of downtown. Boundary of property outlined in red. HOUSTON – (Realty News Report) –The Houston Endowment philanthropic institution is planning to build a new headquarters building near the intersection of Memorial and Waugh drives, just west of downtown. For years, the organization has been located downtown at 600 Travis, a 75-story building formerly known as the JP Morgan Chase Tower. The new headquarters is expected to be a 35,000 SF to 40,000 SF building, expected to open in two or three years, said Endowment president and CEO Ann Stern. 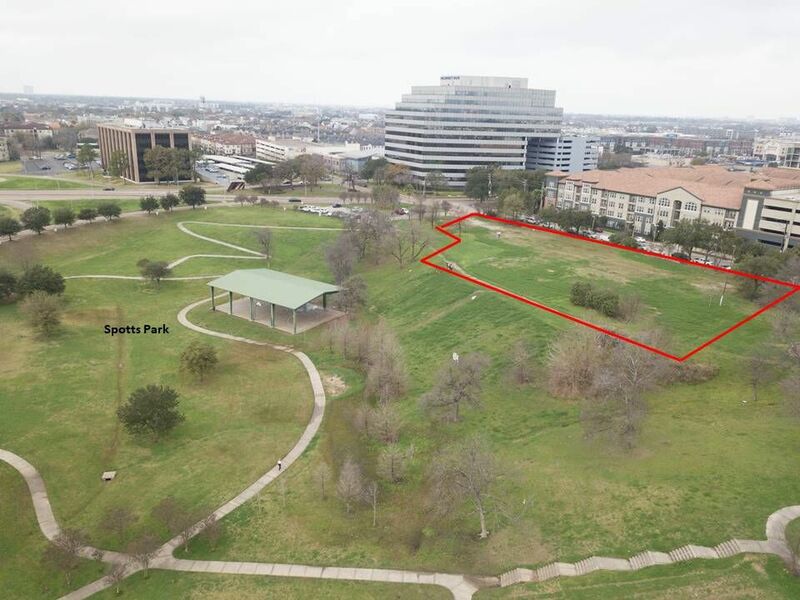 Last week, the organization bought a 1.6-acre site on Willia Street, overlooking Spotts Park and Buffalo Bayou. The seller of the land was Pinto Urban Building LLC., a group led by Ernie Cockrell. Pinto Urban Building had proposed an 18-story office tower for the site in 2014, before oil prices declined precipitously to lows that ultimately damaged the Houston office market. The Gensler architecture firm assisted the Houston Endowment in evaluating the site and other properties that were considered for the new building, Stern said. But the organization has not tapped Gensler for building design, a process that will be deliberated at length. “We want to take our time selecting an architect,” Stern said. The new building needs to have a significant amount of meeting space for groups involved in philanthropic activities and planning. The new building will be more than twice as large as the 16,000 SF the organization occupies on the sixty-fourth floor of the 600 Travis building. Situated adjacent to Midway’s new Buffalo Heights District as well as Buffalo Bayou Park, and in close proximity to downtown, the site occupies a central location between downtown and Memorial Park. The land purchase affords “Houston Endowment, as a perpetual institution, the opportunity to invest in a more permanent home and contribute to the growth of the neighborhood,” the organization said. Houston Endowment was represented in the land deal by Cushman & Wakefield. Tom Forney of Forney Construction has served as the organization’s project manager and David Robins of Jackson Walker has provided legal counsel on the project. With assets of over $1.8 billion, the foundation provides approximately $70 million in funding each year in order to enhance civic assets, strengthen systems that support residents, promote post-secondary success, and build a stronger region. It was established by Jesse H. and Mary Gibbs Jones in 1937. The organization supported the Buffalo Bayou Park development, which will provide a beautiful green view for the new Houston Endowment building.